The preparations for this part of Jane and Rachel’s ancestral tour in Germany started in July, 2010 with a visit to Broistedt by James and Jenean Derheim during an extensive scouting trip they undertook between tours with other clients. A chance stop at the local newspaper stand and a helpful clerk led James to local historian Erich Koechling, who helped James obtain a comprehensive history of Broistedt, later mailed to Jane at her home in Texas by way of James hand carrying this back to Germany when he returned to Florida in the fall of 2010. 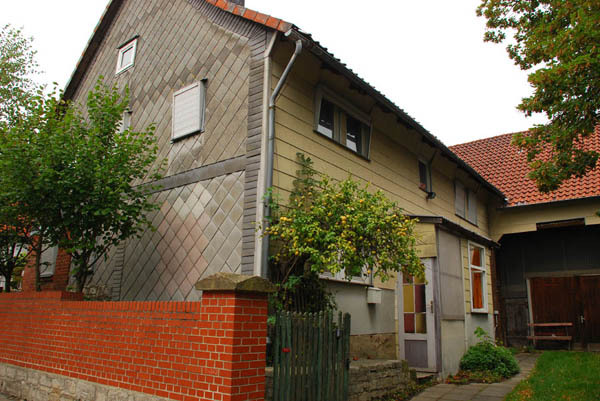 James stayed in telephone contact with Herr Koechling periodically between the fall of 2010 and the spring of 2011. After the Koechlings returned from summer vacation in mid-August, arrangements came together fast for a meeting with the local historian, Frau Brittan, and a cousin, Hannalore Behrens at the Koechling home across the street from the church. We arrived at noon on September 8th. 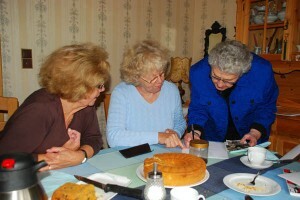 We were greeted warmly by the Koechlings, who had prepared two different coffee cakes along with coffee and tea. We pored over Jane’s ancestral records and we looked at photos brought by Hannalore and Frau Brittan. 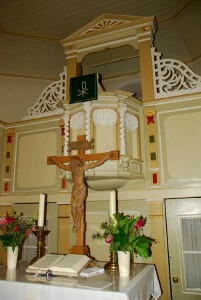 We visited the ancestral church, which is ancient, parts of which date back to the 9th century said Pastor Sonneborn. 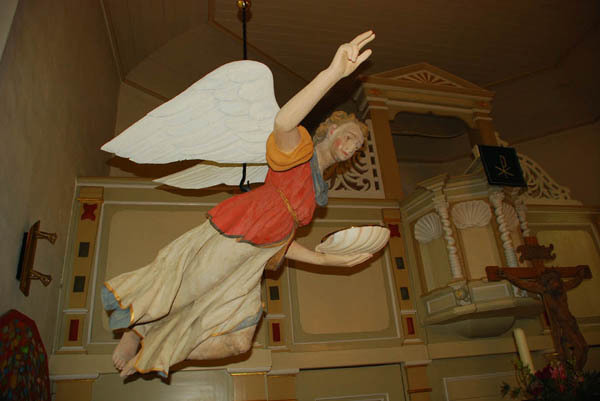 A wooden angel which was kept over the baptismal table (there was never a stone font in use here, at least not that anyone can remember) is hanging in the church again after having been hidden away in the attic from about 1760 to about 1960. The pastor told us that such objects were considered to be too elaborate by the standards of the late 18th century. Then, the angel was simply forgotten. Now she’s back, and the recently restored pulpit and altar look as they did when the Leifestes were attending this church prior to their 1855 emigration to Mason County, Texas. We saw the old schoolhouse and then we walked over to the Leifeste ancestral house. Cousins of Jane’s had visited the village and the house in 1986. The house looks nearly identical in 2011 as it did then, which is not saying it has been kept up. 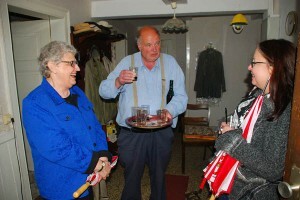 The lone resident is Luitpold Gebhard, a divorced man of about 60 who when Hannalore Behrens (a cousin of Luitpolds and a third cousin once removed of Jane Williamson) invited us all in for a shot of schnapps. Another wonderful day with generous people and cousins ended with a spontaneous visit to Hannalore’s farm in the village of Barbecke, a couple of kilometers to the west. 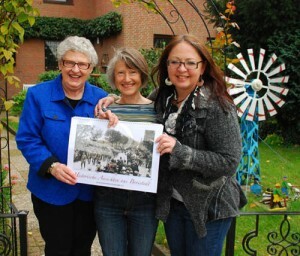 This same farm had been visited by Jane’s cousin, her husband and their son during their visit 25 years ago. Gustav Behrens doesn’t remember the visit, but he was open and kind all the same, gladly sharing with us stories of farming in the region, about how fantastic growing conditions are in this part of Germany and stories of people streaming across the former border, just 40 kilometers away, when East Germany opened its borders in November, 1989. Posted in Family History Tours and tagged broistedt, leifeste.